Guzmania `Orangeade' — Photo through courtesy of Alberts & Merkel Bros., Inc.
My husband and I decided to make an exploratory trip to Argentina, to search for bromeliads. Since my husband is Argentinean, we already had many contacts to aid us in the planning of our trip. We are particularity indebted to Eugenio Pingitore, from the Botanical Gardens, in Buenos Aires, for all his expert help throughout our stay. On the 28th of February, we left Buenos Aires, heading for the northern provinces of Argentina. We traveled in a diesel-fueled Peugeot, which proved to be very economical. The first day, we boarded what is called a "balsa," a raft-type boat, that carried us over the Parana River, into Entre Rios (literally, "Between Rivers"). The roads in this province were quite treacherous, being made of loose rocks. We witnessed several shattered windshields caused by flying rocks. Here we discovered Tillandsia aeranthos on low-growing trees. But the area was literally infested by "elephant-sized" mosquitoes, so we were able to collect only a few samples. From here, we traveled on to the Province of Corrientes, and discovered in a grove of low-growing trees, T. duratii, var. decomposita, 61 kilometers south of Paso de Los Libres. This tillandsia has curiously curved leaves, used to cling to its support. The flower stalk rises from the center, and then is pushed aside as the plant continues to grow. The flower stalk bears pretty lavender flowers which are highly aromatic. The next day, north of the town of Santo Tome, on our way to the Province of Missiones, we discovered Aechmea bromeliifolia, on the side of the road, growing terrestrially. This plant has an interesting pear-shaped form. Its gray-green leaves with hooked spines form a tubular, urn-shaped rosette. We found some in bloom, bearing a red flower. We spent that night in Posadas, the capital city of Missiones. This was a welcome taste of civilization, after spending three days fighting the intense heat, flies and mosquitoes. In order for us to be able to work, it was necessary for us to wear long-sleeved shirts, long pants, boots, and gloves. The Province of Missiones is in striking contrast to the province we had just left behind us. The soil of Missiones is a deep, rusty red, and soon our clothes began to take on the same color. After our respite in Posadas, we continued on to a town called Cerro Azul. We went into a dense jungle, in which our only means of access was through a dried-up river bed. Along this path we stumbled upon a huge black and yellow snake-skin; we were, needless to say, grateful that we did not find the rest of him. Here we discovered Bromelia balansae, in full bloom. It was a thrilling sight! The following day, 4 kilometers south of a town called Santa Anna, we entered an open forest, evidently used as a cow pasture. We discovered a virtual forest of Pseudananas macrodontes, as well as some Dyckia brevifolias and B. balansaes. The dyckias were growing in dense clusters on top of hot exposed rocks. The flower stalk of the dyckia, which we saw growing laterally from the plant rather than from the center as is usually the case in most bromeliads, bore a charming bell-shaped flower of bright orange. This forest provided an ideal environment for bromeliads, due to its particular terrain — a partially shaded open forest, in which the bromeliads could receive much indirect sunlight, plus protection from the intense rays of the sun. We spent the night at a town called Esperanza (literally meaning "Hope"). The seventh day of our trip is quite indelibly stamped in our memories. We ventured into a dense jungle which had been made accessible by the beginnings of forestation. Strewn across the path were huge spider's webs, which contained, to our horror, huge spiders resembling scorpions. Here we discovered the orchid Miltonia flavescens. We were able to collect some from a large fallen tree. The following day, we traveled directly to the Falls of Iguasu, situated at the tip of Missiones, bordered by Brazil and Paraguay. The falls were spectacular, situated in a National Park, which turned out to be a bromeliad lover's paradise. On almost every tree we passed we were treated to an abundant and spectacular display of bromeliads. The experience was breathtaking and unforgettable. After this high point in our trip, we headed south once more towards Posadas. We took a road which went through an intensively forested area, in which the natural habitat had been replaced by tree farms. We did, however, discover Aechmea calyculata in a tree fern forest, near a town called San Vincente. At this point in our trip, we left the Province of Missiones, and traveled again to the Province of Corrientes. Nineteen miles west of Corrientes, the capital of the province, we found T. duratii var. decomposita, and T. bandensis. T. duratii, seen from a distance, gave us the impression of Christmas tree ornaments clinging to low-growing trees, with their curiously curved leaves. We found one plant, which was four feet long from the tip of the bloom to the base. Our third and last day in Corrientes is one we will unfortunately never forget. While we were collecting more T. duratii, we were both very badly bitten by a swarm of wasps. The following day we started out across the country to reach the Province of Tucuman, some 800 kilometers west of Corrientes, which would take us to the other side of Argentina. It was necessary to travel across two other provinces in order to reach Tucuman — the Provinces of Chaco and Santiago del Estero. In the latter province, the roads were extremely bad; one stretch of 60 kilometers was posted as being impassable on rainy days, and even on a "good day" this unpaved road resembled a pasture more than a highway. We found cows grazing in the middle of the road, even a cow nursing its calf. It became evident in the last half of the road that it had recently rained. As a result, the driving conditions were extremely treacherous as the road had begun to turn into a sea of mud. Fortunately, we were able to navigate it without mishap, and arrived at the capital of Santiago del Estero by 10 p.m. We arrived in Tucuman the next day. We took a mountainous road heading north towards the Province of Salta, and it was here, on this seldom traveled road, that we made one of our most important discoveries. Hanging from the sheer face of the cliff, (from which the dirt road seemed to hang perilously), we found T. maxima and Vriesea tucumanensis. We found Abromeitiella brevifolia, as well, growing terrestrially and forming tiny star-like rosettes. It is the only true cushion type in the family. We found it growing in succulent collections. In addition, wild begonias were growing in an array of bright reds, yellows and white. Also in Tucuman, in a section called Quebrada de Lules, we found T. lorentziana. This plant has silvery, recurved leaves, tapering at the tip, forming an attractive rosette. The flower is small, and has white petals. The following day we took another mountain road, heading northward towards Salta, once more. T. schrieteri was seen growing terrestrially. This tillandsia forms a large rosette and has a bright yellow flower. In addition, we found T. vernicosa growing epiphytically in the trees at the side of the road. 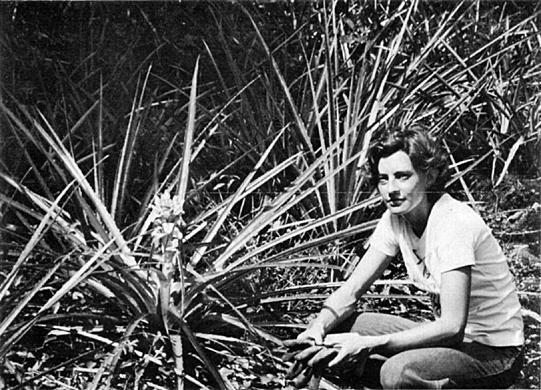 Dorothy Smud and Bromelia balansae. The last day of our trip, before heading back to Buenos Aires, was spent in Tucuman. Since all the shops in the northern provinces of Argentina are closed between 1:00 p.m. and 4:00 p.m. we were waiting in a park for the air transport office to reopen. It was a bright, sunny afternoon, but in a matter of seconds, the sky turned black and a ferocious wind seemed to come out of nowhere. It ripped down telephone cables, metal signs, and tore out trees; branches flew in every direction. The buildings seemed to sway with the impact of this indiscriminating wind. This was, without a doubt, the closest we had ever come to experiencing a tornado. All in all we had been away for over twenty days, traveled some 6,500 kilometers, and found a great variety of bromeliads growing in their natural habitats. In Issue No. 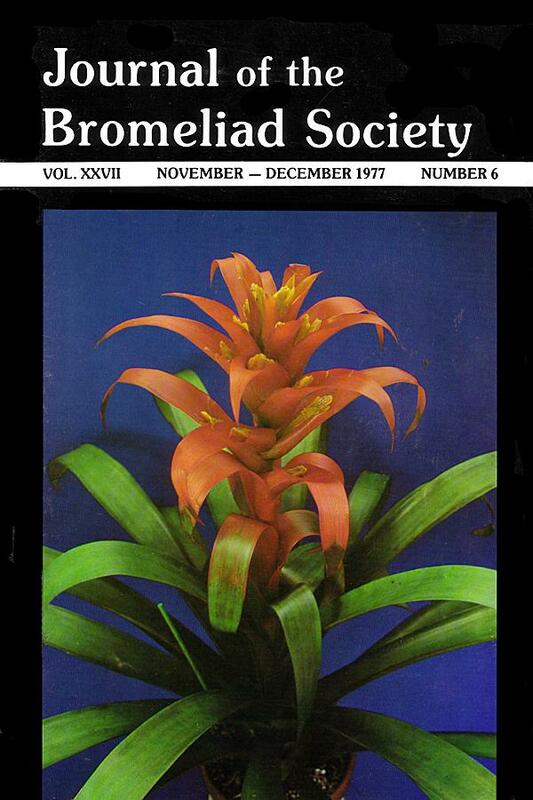 2 for 1978, we wish to list in the Journal all the affiliated organizations of the Bromeliad Society, giving name and address of person whom to contact for information as well as time and place of meetings. Also in this issue we wish to have a Calendar of Events for the coming year. If you are planning to hold a show, please let us know all particulars. This information should be in the hands of Mrs. Thelma O'Reilly, 10942 Sunray Place, La Mesa, California 92041, no later than January 1, 1978. Your cooperation will be appreciated. The illustration of Aechmea lueddemanniana marginata which appeared on Page 59 of Issue No 2 for this year should have been credited to Carlos Jativa. Bill Netherby, Box 545, Morro Bay, California 93442 writes: "I've had luck germinating bromeliad seeds on live sphagnum moss. Some tillandsia species developed several small leaves in a month or two. Billbergias and acanthostachys reached 2 to 3 inches in the same period. No chemicals were used. They were grown in a terrarium in a window with natural light only. I have other data I'd like to share with like kindred spirits and fellow zealots to try the same thing and share their findings." The importance of forests to a region's moisture is illustrated in parts of eastern Mexico where today great forests, once almost continuously saturated by fogs off the bay, have been cut down to make way for agriculture. The fogs sweeping in over the sun-baked fields dry up and evaporate. The fields have become desert. And this was true in earliest history in regions of the Far East where empires and civilizations disappeared in burning sand after the forests were cut. A sampling of Mr. Carrone's neoregelias. For a number of the visitors to New Orleans this past June, their outstanding experience was the visit to the nursery of Joseph Carrone, Jr., in the suburb of Metairie. Mr. Carrone is, in this writer's opinion, one of the outstanding hybridists in the bromeliad world today — his goal of bringing perfection of form and brilliance of color to the genus Neoregelia is one that surely has been achieved. No matter how well prepared the visitor may be for what he is to see, the first sight of the brilliant display of the thousands of highly colored plants in the seedling houses literally takes his breath away — so dazzling is the spectacle. It was in 1960 that Mr. Carrone first started hybridizing bromeliads, trying his hand with a few aechmeas. However, it was not until some ten years later that he seriously entered the field of bromeliad hybridization. Like many of us in those days, Aechmea chantinii held a special appeal for Mr. Carrone, and he sought out the finest forms he could find. After four generations of selective breeding he has produced almost black plants, made startling by the vivid silver cross bands. He has made a number of hybrids using A. chantinii, one of the most notable being A. chantinii × A. tillandsioides. Also outstanding is his bigeneric cross of A. chantinii × (Neoregelia spectabilis × N. carolinae). This becomes leather colored in strong light and has an orange-red cup when in flower. But it is the Neoregelia that has become Joseph Carrone's true love, and he has embarked on a comprehensive breeding program that embraces many of the best forms of neoregelias that he has been able to obtain from Europe and South America. Also notable are the crosses that have been made using N. ampullacea as one of the parents. Most remarkable are N. 'Guinea,' N. 'Little Brown Jug,' and N. 'Pepper.' These are all small-sized, clustering, and stoloniferous plants, taking on the shape and markings of ampullacea and the coloration of the other parent. These are delightful little bromeliads, certainly deserving of a place in every collection. For his larger crosses Mr. Carrone has used N. carolinae, N. concentrica, N. johannis, N. marmorata, and N. princeps. He is using N. concentrica to produce plants of a good clear lavender. He is also endeavoring to get a number of rusty-orange and leather-colored neoregelias. Selective breeding with the best orange plants will bring out a clear orange leaf color and it is hoped to do away with the pinkish overtones in the cup. A truly orange-colored cultivar of N. 'Fancy Free' has been hybridized with N. 'Buccaneer' (N. johannis × N. vulcan) and produced a golden-tan rosette with salmon overtones on the underside and on the leaf tips. Most of the neoregelia crosses mature within two to three years. Mr. Carrone is a meticulous grower, keeping detailed records on each and every plant. His nursery is a joy to behold and he is to be congratulated for the fine work he is doing. This very handsome large tillandsia is native to Bolivia and Argentina where it is found clinging to cliffs and rocks at altitudes of 3,500 to 12,000 feet. It was first described by Heinrich Grisebach in 1879, who named it T. rubra because of its brilliant rose-colored inflorescence. It was renamed maxima in 1917 because of its size, the plant sometimes attaining a height of seven feet in habitat. However, in cultivation, as seen from the above illustration, it is much smaller. Whatever the size, the lovely inflorescence with its bright rose bracts and purple petaled flowers remains outstanding and large in comparison to the proportions of the rosette. It is beautifully illustrated in A. Castellanos' great book on Argentinean bromeliads. Little seen in cultivation, as it is not easy to grow. Neoregelias are probably the most commonly cultivated bromeliad, yet only a relatively small number of growers will bother to attempt to grow these lovely plants from seed. The problem undoubtedly stems not from the growing of the seed, but from the scarcity of harvested seed. Some bromeliads, for example aechmeas, vrieseas or tillandsias, flaunt their seed before our eyes, and we could hardly miss seeing it. Neoregelias, on the other hand, seem quite reluctant to display and distribute their seed; it develops deep in the cup and has to be sought. Furthermore, unless certain precautions are met, the seed will not develop at all. Fortunately, the steps necessary to obtain seed in neoregelias are not complicated; the method lies easily within the reach of all of us. Let us begin at the point where a neoregelia begins to bloom. The actual flower may be overlooked, since it is small, appears in the cup, and is frequently out-shined by a lavish display of color in the leaves. They will be any shade of blue or purple or may be plain white. Some of the flowers are also a blend of two shades of blue. The petals are usually flared at the peak of bloom; some will lay out quite flat, while others allow only a narrow peep into their insides. They remain open for only a few hours, beginning at about three hours after sunrise and ending sometime in the mid or late afternoon. The intensity of the sun plays a role in this flowering period. The flowers open early on sunny mornings. On cloudy days, the flowers may not open fully. Also dependent on the sun is the ripening of the pollen. It, too, does not perform well on cloudy days. Also, high humidity may retard the ripening of the pollen. In southern California, we have noticed that a year in which the summer is more humid than others yields little neoregelia seed. However, if the humidity is accompanied by a lot of air movement, its negative effect is diminished. Growers in the south and southeastern United States, who have their plants outside, should experience no trouble obtaining seed on their neoregelias. In the native habitats, a myriad of insects pollinate the neoregelias. In cultivation, however, we cannot rely on this method. Although neoregelias often set seed with no help from us humans, we can increase the probability of seed production greatly by lending a hand. First of all, as the plant begins to bloom, remove all the water from the center of the plant, and keep the center dry until the seed is harvested. When these plants are growing in their native habitats, this dry center is achieved either through drought or through a unique device from Mother Nature: the plant becomes weak-kneed and leans over, dumping any water that might lead to rot or premature germination in the seed. During these months while you are keeping the center dry, you should not neglect to water the potting medium. Although the roots do not transmit much nutrition to the rest of the plant, they do provide water. The only tool needed to hand pollinate is a small artist's brush; or even a lead pencil will suffice. The flower is receptive to pollination only during the time that the pistil emits a tiny droplet of nectar at its tip. Unless you use a strong magnifying glass, you probably will not be able to see the nectar at all. It appears sometime after the flower opens and lasts only a short time — perhaps no more than fifteen minutes. This period is usually sometime between 9:00 and 11:00 a.m. Therefore, if you are intent on achieving seed set, you should work on the flower several times during the morning hours. The process involves only inserting the brush into the flower and dabbing it around a few times. This tactic should transfer pollen from the stamens to the pistil. If the pollen is ripe, you will see it as a whitish or bright yellow powder on your brush. The pollen remains ripe for a much longer period than does the pistil, so do not think that you can stop as soon as you see pollen on your brush. Neoregelias produce from one to four (seldom more) flowers per day. The small varieties, such as Neo. ampullacea, Neo. 'Fireball', etc., will have only six or eight flowers in all. Other specimens may have ten times that many flowers. In the latter instance, the entire bloom period may extend over a period of a month. Hopefully, you will have your mornings free. If not, and if you are a genuine plant lover, you will carry plant and brush with you to the office! When the last flower has faded (they appear first at the outer edges and last in the very center of the flower head), you can relax or turn your energies to other pursuits. You only need to water the plant's soil until the seed is ready to harvest. The seed development in neoregelias takes about six months. By the end of five months or perhaps a little sooner, you will be able to ascertain whether your efforts were successful. If seed is on its way, the defunct flower will show a fat, berry-like ovary immediately below the place where the petals were. The berry will be nearly white. In some bromeliad genera, Aechmea for instance, the berry will show a definite color change when the seed is ripe. Not so in the neoregelias. But maturity is nevertheless easily determined. If the berry detaches from its pedicel quite easily at the slightest tug, it is ripe. Do not attempt to harvest the seed before it is fully ripe, for you will most probably not have viable seed. The contents of the ripe berry will be a gelatinous substance around many dark brown seeds about the size of the seeds of a strawberry. For easy handling, you will want to rid the seeds of their sticky jelly. Squeeze them into a closeable jar. Add an inch or two of water and one drop of liquid detergent. Close the lid tightly and shake the contents. Leave the seeds in the jar for 24 hours and shake them as many times as you find convenient during this time. After 24 hours, strain the contents through a very fine mesh. Most tea strainers are not fine enough to catch the seed. A good strainer can be made from a section of nylon hose stretched over a jar or pan. You may want to run more clear water over the seeds to remove any suds that may be present. Then spread the seeds out on a paper towel, napkin, or even a piece of typing paper. Let them dry for at least a day, then they can be raked easily from the paper into an envelope or other suitable container. Do not store bromeliad seed in a tightly closed glass or plastic container, because they might perish from fungus or premature germination. A paper envelope allows enough air circulation to prevent these problems. A neoregelia such as Neo. carolinae can produce as much as 2000 seeds. Not many of us can accommodate that many plants. Therefore we urge you to share your good fortune with other members of the Society by sending your surplus to the Seed Fund. A variety of containers has been used as starter beds for seedlings — plastic pots, margarine tubs, refrigerator dishes, etc. The container should be deep enough to hold at least an inch of soil and leave another inch or more at the top. It is also essential that the container have bottom holes for watering. Overhead watering is sudden death to very young seedlings. Since constant moisture and high humidity are necessary to germinate the seed and get the seedling started on its way, the container should also be enclosed. You may want to use a plastic bag around the whole container and tied at the top. This method, however, makes it difficult to observe the daily progress in the pot. Some growers set several seed pots in an empty glass aquarium and cover it with a pane of glass. A very handy set-up is to use a clear plastic drinking glass as the pot and cover it with a petri dish (available from a hospital supply store). The medium used for sowing the seed must be of a fine texture. Do not use the loose, coarse mix that you might use for adult bromeliads. A good commercial house plant mix containing fine humus and sand is fine. Wet it with only the purest water. 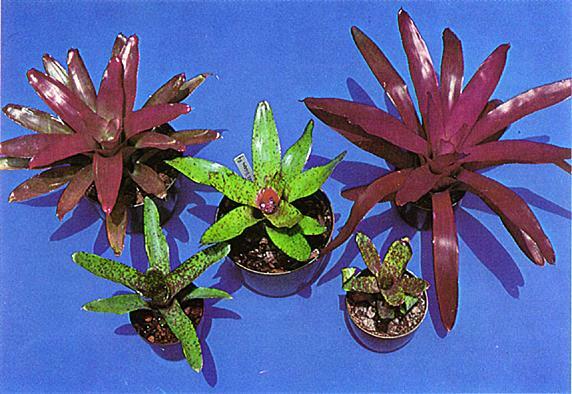 Most drinking water contains too many suspended particles of solids for bromeliad seedlings. Bottled spring water or rain water is much purer. Never use softened water. To prevent damping off, you should use a fungicide in the water, such as Benlate, Benomyl or Physan. Other brands may be available in your area. Consult a local nursery for a recommendation. Tamp the soil firmly and sow the seed on the surface. Do not cover the seed with soil. The seed can be sown rather dense, so that the plantlets help in providing humidity for each other as they develop. One authority recommends that the seed be sown thick enough so that the first set of leaves touch the leaves of their neighbor. However, as long as you are able to maintain a high humidity for your seedlings, a wider spacing is also satisfactory. Using this wider spacing, you can postpone transplanting until the seedlings are more mature. After the seeds are sown, cover the container or enclose it in a plastic bag. Mark the container with a permanent tag showing the date and the name of the plant. You may also want to record the number of seeds sown, in order to study the viability of the seed. Set the container in a warm place. If you are starting seeds during the winter and your growing area is not heated to at least 65°, you should set the container on a soil heating cable. A very good substitute for this bottom heater is your refrigerator — not the inside, but the top. The refrigerator produces a constant heat from the back. It is ideal for starting seedlings. Neoregelia seed, with a good temperature, germinates in about 10 to 14 days. If the seed is old, or if the temperature is too low, germination will be slower and probably less successful. At about the time of germination, be alert to the possible growth of fungus, moss or algae on the soil. Growers commonly are harassed by a dense layer of such growth that does not attack the seedling directly, but prevents the movement of water and air through the soil. If you encounter this problem, try to quell it with a fungicide spray in a solution with pure water. Sometimes it becomes necessary to pick off this fungus/algae mat, with probable damage to the seedlings. It is less a problem with these relatively fast growing neoregelias than it is with the slower guzmanias and vrieseas. Keep a careful watch on the moisture in the soil. It if becomes dry, do not water from above, but set the pot in another container of pure water for the soil to soak up the water from below. You may use a very fine mist from above. About two weeks after the seeds have germinated, you should begin to use a very weak solution of fertilizer in the watering or misting. Dilute the fertilizer to ¼ the strength recommended by the manufacturer. Apply it no more often than once every two weeks. Continue this care until the plants' second set of leaves are well formed. This is the earliest possible time to consider moving the seedlings from their seed bed. Some growers prefer to wait until the plants are older, claiming that losses are thus reduced. It is probable, however, that the growth of the plant is less severely retarded if it is moved early. When moving the seedlings into a community pot use the same medium and space the plants so that the leaves almost touch. Thus they will retain more humidity. Some growers place them in rows in a flat, others plant them randomly in a ten-inch pot or pony pack. Carefully pick out the seedlings individually with a knife tip or a tweezers and tuck them into their new home. Again, top watering is not advisable; water by setting the pot in a pan of water and by misting. Only after the seedlings have developed new roots and become well established in their new pot, should you water from above. Even with careful attention, you can expect about 10% loss. At this point you should increase the strength of bi-monthly fertilizing to no more than ½ the strength recommended by the manufacturer. Leave the seedlings in their community pot until they become clearly crowded. As you move them up into individual pots, you may now use a coarse, porous mix appropriate to adult bromeliads. An example of a good mix is 1 part potting soil, 1 part fine fir bark chips, 1 part perlite (sponge rock). The size of the pot for this move is debatable. Some growers tell us not to over-pot, others quote a maxim that says: "If you want a big plant, put it in a big pot." Continue caring for your plants as before. Use half strength fertilizer twice a month and flush the cups with each watering. Keep the plants in bright light without direct sun and maintain a high humidity around them. Some neoregelias will reward you with full inflorescence and bloom three years after sowing the seed, but most will take four years. The wait may be long, but you will have the satisfaction of knowing that you had a hand in the whole process. It is certainly a great thrill to develop a distinctly new plant. This achievement is also within the reach of anyone who has two different neoregelias in bloom at the same time. You will also need a strong magnifying glass, a small scissors and a small brush. A neoregelia flower announces its opening on the evening before the grand performance. The petals, still tightly closed, will rise above their neighboring buds. One glance at the center of the plant will tell you which flowers will be open the next day. If you want to cross two species, you must assure that the pollen of the flower does not reach its own pistil before you introduce the pollen of another plant. To achieve this trick, it is necessary to lop off the pollen pads before they ripen, i.e. on the evening before bloom. Pry open the petals, bend them back and snip them off as low as possible. Then use your glass to locate the stamens and the pistil. When you are sure which are which, cut off the stamens. Be ruthless. Let not even one survive. On the next day, when the pistil is receptive and the pollen of the other plant is ripe, use your small artist's brush to transfer pollen from the one plant to the lone pistil of the other. Ideally, this process should be repeated for every flower as the plant progresses through the bloom period. If you are able to perform the operation for only one or a few flowers, then you will want to remove completely all the other flowers that appear. If the cross has been successful, you will get seeds in about six months. Plant them and enjoy their development. It is possible for these flowers to set seed without actually having been hybridized. Sometimes a flower is triggered into seed production by the mere presence of any pollen without that pollen having transferred chromosomes to the target plant. In this case a cross does not occur. The chances of such an occurrence are slight, and your efforts most probably will result in a hybrid. You will know only when the resulting plants reach maturity. Pollinating, cross pollinating and growing from seed are not complicated processes. With the little bit of knowledge presented here and a modicum of patience, you can increase your enjoyment of bromeliads many times over. THE INTERNATIONAL ASSOCIATION FOR PLANT TISSUE CULTURE — There is currently a great interest in the subject of plant tissue culture among those engaged in breeding or propagation. This is particularly true of a number of the plant specialty groups in which ordinary methods of propagation are somewhat slow. This organization publishes an informative newsletter which gives new technical information, notices of meetings, and reviews of new publications. The membership dues are very nominal, only three Canadian dollars a year. Currently the Canadian dollar is worth less than the American dollar, but consult your local bank for rate of exchange before remitting dues. They should be sent to Dr. Trevor A. Thorpe, c/o Department of Biology, The University of Calgary, Alberta, T2N, Canada. The price of Bromeliads for Modern Living by Louis Wilson is $3.25. See P. 226 of Issue #5 for this year for details. F. Escher and H. Strech of the German Federal Republic have been experimenting with the control of flowering in guzmanias. Plants were sprayed once with Ethrel (ethephon) at monthly intervals between April and December. For Guzmania minor 'Orange' treated in months from April to September the average time from induction treatment to flowering (plants ready for sale) was 54.3 days. For G. monostachia the corresponding time was 38.7 days. Plants treated in October to December generally took longer to flower, being retarded by the short days and lower light intensity. During the 1977 World Bromeliad Conference, and especially that Sunday, June 5th, several hundred hobbyists and commercial growers alike visited our bromeliad garden and greenhouses. Ever so many persons were heard to remark — or question — how our new Neoregelia hybrids were all such full-leaved and symmetrical plants. Well, for the benefit of all who could not attend the conference, or who did not come to our place, or who just didn't ask; I shall make a few comments on the conditions under which we grow our plants and on some of the cultural methods we employ to achieve the degree of perfection evident in them. Let me say, first of all, that many of these fine qualities must be inherent: they have to be bred into a plant no matter whether that plant be a species from the jungle or a hybrid developed by man. Then, in order to bring out these qualities, it is necessary to provide the proper environmental conditions and to develop appropriate cultural methods that will allow these inherent qualities to come forth. I have outlined seven points that I feel are essential to success as we know it. Some growers will not go along with all of my points, but hundreds of bromeliad growers saw our plants during the three days our greenhouses were open. I am sure they will agree that our plants were all extremely well colored with no leaves breaking the symmetry. We never subject our Neoregelias to temperatures below 53°F. As winter approaches, all of our Neoregelias are properly spaced inside our glass greenhouses. The pilots on all heaters are turned on and the heaters are "burned off" during the daytime while the ventilators are open. Then, when heat is called for at night, all is ready. Incidentally, we burn natural gas in vented heaters with blowers to distribute the heat. All heaters are thermostatically controlled. This 53°F. low setting helps hold the lower leaves and prevents those small, round, yellow or water-soaked spots that can show up on the leaves during damp, chilly times if the temperature falls below 50°F. and into the high 40's F.
We give our Neoregelias high light values during the winter. To maintain growth, retain leaves and color, all leaves must take part in the synthesis of chemical compounds that enter their tissue through the roots, leaves, etc. To do this, they must be exposed to sufficient light or they are shed by the plant. All too frequently, hobbyists crowd their plants together in some enclosure for the winter in order to keep them from freezing. Without sufficient light and heat, this can be just as disastrous as allowing the plants to remain outside. By springtime these plants could be in very poor condition with half the leaves lost and the remainder so drawn out and off color that much of the spring and summer is required just to bring them back to health. Well, we try to have growth continue during the winter. Plants are arranged so that all leaves get sufficient light and air circulation. We make sure that all large seedlings and near-mature plants get around 3000 footcandles of sunlight during this period. In our area of south Louisiana, just a short distance from the Gulf of Mexico, this means that even during January it is necessary to have some shade on our greenhouses so that the sun doesn't cause leaf burn. If it were not for the intervals of spring-like weather every few weeks during the winter when the temperatures can climb to the mid 60's and higher, we could offer our Neoregelias even more light and, thereby, get more intense color in them. But we are satisfied with this light level. We do not have to be concerned as the temperature climbs. We use water lavishly. Humidity in the greenhouses during the winter is kept over 60% by daily sprinklings in mid morning if possible, but by 2 p.m. surely. Ventilators are opened as the inside temperatures approach 70°F. Frequent heavy waterings — drenching wettings — are given at least once a week during the indoor season. But, as spring approaches and some plants go outside, the waterings are stepped up to as often as every three to five days. Overhead sprinklings are also continued on a daily schedule. Natural rains during the summer occur in the early afternoon hours and usually they provide all the moisture necessary for good growth of our outdoor plants. Our municipal water source is most suitable for bromeliads. The pH factor could be lower, and a couple of other additives our plants could do without, but our water will grow fine bromeliads. We never fertilize our Neoregelias. There are some excellent growers in this area; and would you believe it, they never apply supplementary food to their plants. In fact, we all feel that the most important single factor contributing to symmetry, compactness and color has got to be our attitude toward the nutritional needs of our Neoregelias. Our plants are never over-stimulated into developing irregular growth. They are never "greened up" by the nitrogen that fertilizers contain. We use a potting mix that is mostly or totally organic. I prefer to grow Neoregelias in osmunda fibre in small clay pots. A small amount of osmunda goes a long way and most of our Neos. can be grown to maturity in 4" or 5" clay pots. On top of a little more than a third pot of drainage material such as haydite or broken pot fragments, I place nearly two thirds of osmunda, tightly packed about the base of the plant. The osmunda is all organic material. No other material is used along with it. This gives a Neoregelia a good start and continues to feed for the entire life of the plant in this pot. Though many growers say that they cannot use osmunda because it goes bad on them, this does not have to be true. Osmunda that was stored under cover and allowed to dry out until it becomes crispy is usually useless as a potting material alone. If, however, it had been kept alive by having been stored out of doors and in the weather, it would be alive even after two years and would indeed be a good potting medium. Even after this length of time the core of the fibre would be moist and green. This is a fact about osmunda that very few growers are aware of. I never have trouble with osmunda. It grows fine Neoregelias for me. I also use a mix containing both redwood and fir bark with German peat, vermiculite and builder's sand. To this I add haydite for bulk if I intend to pot into larger than a 4" pot. I use this mix only in plastic pots, not in clays. This mix is kept damp and never allowed to dry so that the barks and peat continue to break down to offer their nutrients as food to the Neos. I might say here that this is enough proof to us that Neos., at least, don't need all the food that most hobbyists want to give them: they can get by with a lot less food than man thinks they ought to have. We give our plants plenty of light during the summer. Germinating seeds are given from 1800 to 2000 footcandles of light. This is sunlight alone. No other light source is used because all of our seeds are germinated during the long days of late spring and summer. By October all Neoregelia seeds are up. Up to 4000 footcandles of light are given to all plants that are half grown or larger if they are still in the greenhouse. However, shade cloth providing 55% actual shade is used over outdoor plants to reduce the summer sun from 9000-10,000 footcandles down to 3500-4500 footcandles. This produces high color in our plants. Possibly the greatest factor to success has to do with the human element! To grow fine Neoregelias takes dedication. It cannot be a "sometimes" thing or a summertime project. Every day of the year counts even if only in a very small way. It becomes easy to care for plants when they begin to respond to the added sunlight and day length as spring approaches: when they begin to beam with color and renewed growth; but, if they had been neglected during the dull days of winter, the scars will soon show up as new growth begins to mature. Some leaf tips will be marred as they begin to show out of the center of the plant, or older leaves will have developed necrotic spots on the sheaths, etc. Neoregelias reflect the attention given to them. Our system works well for us and it will work for you, too. Now, if there are any secrets to our growing Neos, they are all let out! Marge and Eric Knobloch of Mary Plantation. Despite New Orlean's notoriously hot and humid summer weather, the largest contingent of bromeliad enthusiasts yet to be assembled in one place accepted the invitation of four of the local bromeliad societies to view their plants and gardens, listen to lectures by learned members of the group, partake of a real southern dinner, and just have a good time. Almost 700 people accepted the invitation to take part in these activities. Much effort must certainly have gone into the planning, for the guests were rushed hither and yon, with nary a moment to dry off, but they all seemed to enjoy themselves. There were many gardens to visit and patios in the French Quarter to see, and a few lucky ones were able to visit the Knoblochs at Mary Plantation in Braithewaite. Theirs is a gracious old home, several hundred years old, set amid age-old oaks with all the charm one associates with the Deep South. The gardens, otherwise, were small and certainly well manicured — not a leaf was out of place or a neoregelia spotted by wind or weather. For the most part, the gardens were chiefly display areas for the owner's brilliant neoregelias, and neoregelias there were by the thousands, for this is truly neoregelia country. It would seem that most of the plants had been grown in pots especially for this occasion and then sunk in the earth or gravel. Outstanding is the collection of Cliff Siverd, who probably has the largest private neoregelia collection anywhere. His plants were notable for their brilliant coloration and perfection of form. All are grown under a shade cloth. But the focus of attention was on the show staged by the four societies. It occupied a large room in the Braniff Hotel and consisted chiefly of 26 tables, 30 feet long, on which were placed — you guessed it — neoregelias. There were other bromeliads, to be sure, but these were few in number; however, what the show lacked in variety, it certainly made up in brilliance. It was interesting to note that most of the plants were hybrids (mostly unknown to us from the West), species evidently being not too popular here. 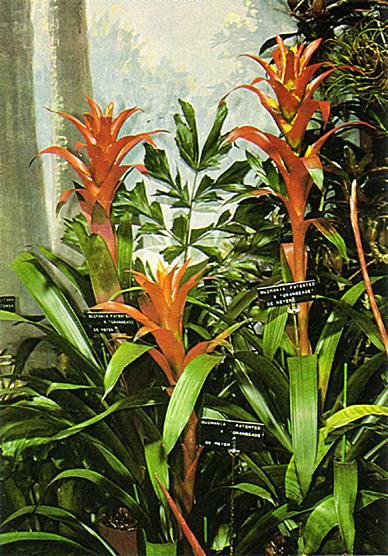 There were several exhibits by out-of-state societies, the finest being that of the Bromeliad Society of Broward County, Florida, which featured the new Belgian guzmania 'Orangeade,' shown on the cover of this issue. The banquet was a true Cajun feast consisting of good old Mississippi catfish, 'dirty rice,' and bread pudding, eaten to the accompaniment of a Dixie Land Band. There was no program; instead, those who had made the weekend were thanked, and then most of the members disbanded either to view the show again or to make a night of it on Bourbon Street. Members are requested not to write to the editor asking her aid in securing past issues of the journal prior to 1976. There is none available at this time and waiting lines cannot be accepted. Only journals for 1976 may be obtained; these are $7.50 and may be secured by sending a check made out to the society in care of the editor. displayed by Mal Mele of Metairie, La. 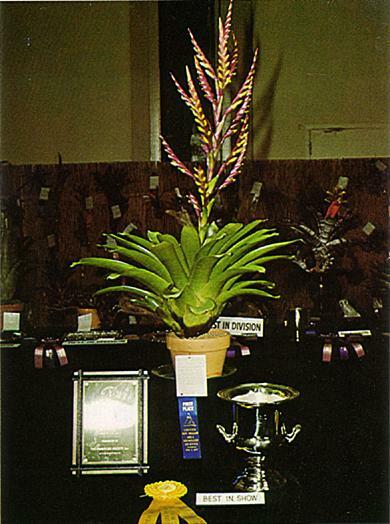 Prize-winning display of the Bromeliad Society of Broward County, Florida. 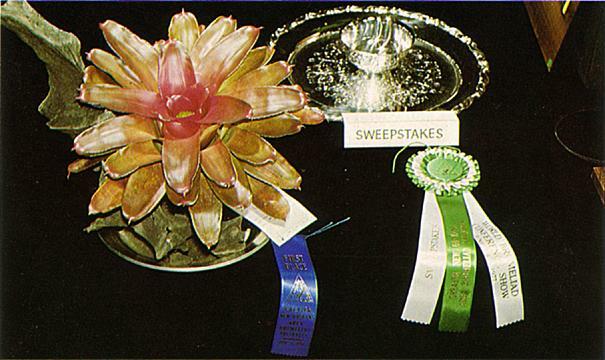 Sweepstakes Award — Neoregelia 'Fancy Free' displayed by Jeanne Garman of New Orleans. Almost everyone I know who is into plant-collecting keeps a list of things that are regarded as must acquisitions for the future. And just about everyone I know is constantly lamenting about the need to curtail plant-collecting — usually for a variety of reasons, but especially for lack of cash and space. Well, to all of you, the recent International Bromeliad Conference in New Orleans means both bad and good news. Bad because there were literally hundreds of new hybrids on display which most people are going to want (or at least a healthy portion of them) and bad because almost all of them are scarce and expensive and are likely to be hoarded in future years so that they will stay scarce and expensive. The good aspects of the situation are these: so many of the new hybrids are bigger and more beautiful than ever and, further, most people who have thought their collections had already grown to Frankenstein proportions get a new perspective when they see how much more there is to collect and how many other people are so far ahead of them. I've seen some very large plant collections here in Florida and felt my own was of respectable size. But after some of the tours we had in New Orleans, my own collection seems phone-booth size and even the largest collectors in our local society won't be hard-pressed to find new things to want. I keep two lists of bromeliad plants. The larger list contains plants I would like to have in my collection, but don't feel are first priority. I am willing to take them if they come my way at good prices or trade and try my hand at them. Then, I have a much smaller list — constantly being revised — of plants which I feel I must have; and although I know I will have to wait for these, too, until someone has them to trade or is willing to sell them at a price not motivated entirely by greed, they are ones that I feel confident I will be able to acquire and especially look forward to having. I try to keep this latter list down to about a dozen plants. In New Orleans, I wrote down 43 plants that were new to me; and while I am sure that will seem a lot too many, let me assure you, I did a lot of selecting and rejecting to come up with this number. From it, I put only three plants on my special list. That would have meant 15 big ones to look for, except I was lucky and found one of my "specials" at the New Orleans sale. The local societies had thousands of plants for sale at really reasonable prices; and if you looked carefully and quickly (especially that) you had a chance. I had wanted Guzmania lingulata × dissitiflora ever since I saw it in Miami about a year ago. Found it. Big plant, little price. Oh, yes, the three plants I finally decided to add to my special list are Neoregelia 'Fancy Free,' which I like even better than 'Strawberry' and which some locals got, either at the sale or from commercial growers; V. tessalata [sp?] × viminalis Rex (which won best of the show and as of this writing is available in some catalogs at prices not too outrageous); and Guzmania 'Orangeade', which I understand is a new Belgium hybrid, not yet available in this country. Alberts and Merkel of Boynton Beach were advertising they would eventually have it. I didn't have the courage or the strength to ask the price. It would have been too depressing. In most issues for the coming few years there will be a center fold to be pulled out and put into a portfolio. This fold will consist of pictures in color and black and white of new and interesting bromeliads that Dr. Werner Rauh of Heidelberg has collected. These pictures and descriptions will be by Dr. Rauh, who has kindly offered to do this for the Society. Dr. Rauh is without a doubt the most important figure in bromeliad collecting today, and his contributions are beyond measure. This is a rare opportunity for members to gather material on new plants, and we are deeply indebted to Dr. Rauh for this offering. All members who have not renewed their membership for the coming year are urged to do so at once. If a visitor to New Orleans expects to see age-old trees draped with Spanish moss, he is doomed for a disappointment, for the once ubiquitous Tillandsia usneoides is gradually falling prey to a mysterious ailment that has baffled many of the experts. This same situation has occurred in Florida, but gradually the moss seems to be coming back in that state. True, this bromeliad may still be found along the bayous in Louisiana, making this area for all the world like part of a mystical kingdom. 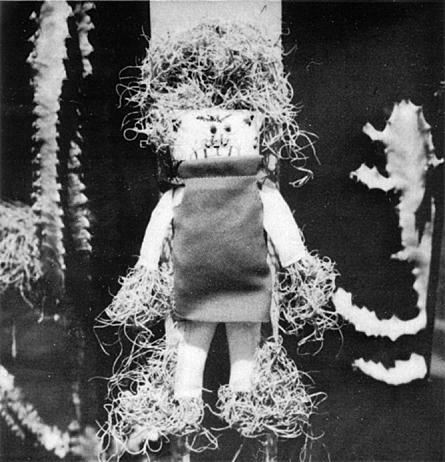 But in New Orleans, the only Spanish moss this writer saw adorned the voodoo doll pictured above. This interesting memento of the old South was purchased in a voodoo shop in Bourbon Street in the French Quarter and comes complete with a vial of dove's blood, pins, and specific instructions on how to rid yourself of unpleasant acquaintances. A pitcairnia growing in the garden. First, to give readers an idea where this tropical garden is located — the town of Puerto Plata lies by a bay which Columbus thought was a good place for a port and settlement way back in 1494. It lies on the north coast of Hispaniola, in that part which has long since become the Dominican Republic. The garden is named after three Royal Palms situated near the entrance, each bearing a great crown of leaves 40 feet overhead. As you enter "Three Palms" to the right in a corner is a clump of tall, profusely flowering form of Aechmea mulfordii, then a bed of A. mexicana, and after that a semicircle of a yet unflowered hybrid of Portea petropolitana var. extensa × P. leptantha, already with 30-inch leaves. Behind a hedge, around a small pool, are variegated Ananas comosus, the tall, light-blue flowered Billbergia tweedieana, large plants of Vriesea tuerckheimii, an endemic from the seacoast to the mountains, and a dozen or so pitcairnias, most of which are also endemic. Hanging on pieces of treefern logs on the left side of the pool, there is a specimen plant of A. purpureo-rosea, big plants of A. dactylina, A. nudicaulis with long, curved red-bracted inflorescences — much favored by assorted chewing bugs — the insignificant A. triticina, and a large plant of A. caudata. 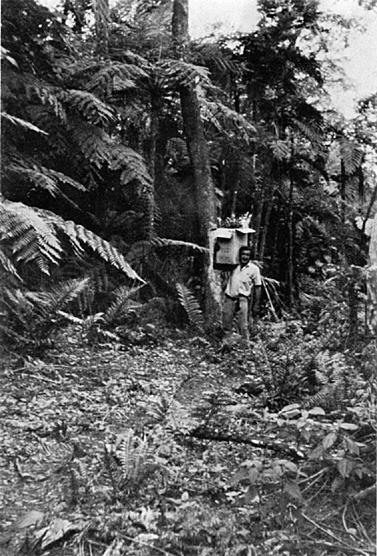 On uprights climb large specimens of A. fosteriana and A. 'Bert.' On the other side of the entrance to this section, growing in the ground are clumps of A. phanerophlebia, the beautiful A. aquilega, deep yellow flowered A. eurycorymbus, A. serrata with the whole inflorescence delicately tinted a light lavender, and A. wittmackiana. Above them hang in small pots long since outgrown A. ramosa and a hybrid of it A. 'David Barry,' A. araneosa, A. leucocarpa and various A. angustifolia hybrids. Behind these on tall tree fern trunks shaded by a mango tree are tillandsias and the endemic Guzmania ekmanii. Then comes a gravel parking place with two screen houses, containing both cement tables and rods for displaying vrieseas, orchids, ferns, anthuriums, and many seedlings. Many tillandsias are to be found both inside and outside both houses. Come with me back to the entrance and look at the left this time. There, on an African oil palm (Elaeis) are many growths of Aechmea 'Bert' and A. orlandiana in the boots interlaced with a thin stemmed, much branched, white and red flower cactus from Costa Rica and yellow flowered Oncidium orchids. At the foot of twin Mauritius palms are several plants of A. bernouillana, synonymous with A. mexicana, but looking very different. The last palm in the row, an Arecarpum, plays host to a large clump of many spiked T. fasciculata. Turning into the central part of the garden, we see pots with a form of Ananas comosus, either very primitive or reverted here to the wild; A. bracteata and a hybrid of A. phanerophlebia × A. distichantha with longer pink inflorescences than either of the parents. 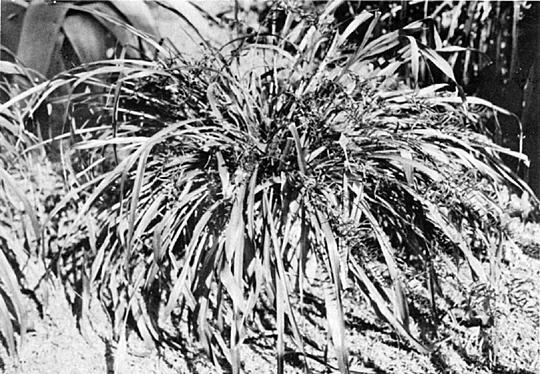 Then comes a bed with tall A. mulfordii and A. lueddemanniana var. rubra and on the lawn are containers of A. castelnavii, A. tocantina, and A. pineliana. A. large Saman tree throws a light shade over this part of the garden. More aechmeas, billbergias, and pitcairnias complete the display of container plants. On stems of a bougainvillea climbing to the top of the Saman tree are clumps of A. miniata × A. fulgens discolor, A. fulgens discolor. Passing to the center of the shaded part of the lawn, around an erect, lacy philodendron is a group of pots of the large Vriesea sanguinolenta with shiny green leaves and erect, few branched inflorescences, big green bracts, and light green flowers. On tree fern trunks in the ground and in pots are Neoregelia eleutheropetala from Amazonia doing fine as an epiphyte, guzmanias, vrieseas, aechmeas and a number of billbergias. There is also an enormous plant of Aechmea nudicaulis × A. fasciata on a short treefern log mounted in a pot, and also an A. bromeliifolia × chantinii. Completing the circle are a number of Hohenbergia stellatas. Looking towards the avenue in front, one can see plants of A. mulfordii and A. fulgens var. discolor planted around the lawn, A. mariae-reginas in pots, a semi-circle of A. bracteata and Portea kermesina with red purple leaves and erect, pink-flowered inflorescences, lamentably short lived. Then come more potted plants of aechmeas and canistrums. Next in the shade of a spreading Calliandra tree with pink tufts of flowers and streamers of T. usneoides hanging down are large clumps of A. dichlamydea var. trinitensis and Portea petropolitana var. extensa and from there on many colorful neoregelias. On top of a nearby tree trunk there is a large clump with some seventy growths of Quesnelia marmorata, with some wine-red T. capitata hanging down. Next there is a round bed with A. setigera, the bronze form of Neoregelia cruenta, one plant of the purple and gray T. hildae, with a border of the prolific Cryptanthus bahianus. Finally, a long bed in full sun contains different bromelias and hechtias. Then there is the last screen house with a few cattleyas and other orchids as well as platyceriums. Below these on benches are different neoregelias and guzmanias and on the floor a number of nidulariums. Which is my favorite bromeliad? It is Aechmea zebrina. It is large, cross-banded, the inflorescence has a stout red scape and many red bracts below curved, upthrust long spikes with whitish bracts, which last for months and is satisfyingly big. To conclude, I would say that it is amazing how many species from different locations and to a certain extent, altitudes, do grow for me so close to the seashore, for some of our native species from the mountains when brought down quickly lose their bright colors and refuse to grow. The ruby red Vriesea sintenisii fades to a dull reddish green; the magnificent Tillandsia hotteana with its long, erect red-bracted inflorescence will not live; the splendidly cross-banded Vriesea ringens loses its markings and if it stays alive, becomes green with but faint reddish spots. The solution seems to be to grow such species from seed right here at sea level, as I have found with certain species. I have found that there is one advantage of growing plants outdoors on pieces of treefern logs; in but a few years you have specimen plants; the disadvantage is the damage of many leaf-eating bugs. I have extended myself in citing names of many species in my garden and could have given many more, but trust that it will give the bromeliophiles some idea what can be grown in the Caribbean islands. And so, "Hasta luego." There is presently under preparation another Society booklet — this to be on hybrids. In it, so far as it is possible, will be a list of the hybrids that have been made and that are worthy of consideration. As interest in bromeliads grows, more and more hybrids are making their appearance — what they are and who is responsible for them are two factors that should be known. The membership is urged to assist in this effort to bring a little order out of the chaos that abounds by registering hybrids or at least describing the plants. For copies of The Bromeliad Glossary and Bromeliads by Walter Richter, send check to the Editor. No books will be sent unless payment is first received. For copies of the Bromeliad Handbook send check to Charles Wiley. PROBLEMS. PROBLEMS. PROBLEMS. In the United States the great problem seems to be scale and snails. In New Zealand it is the weta. In Australia, Bernard Stonor has not had trouble enough with a plague of grasshoppers, but is having his bromeliads chewed by dogs. Ubiquitous questions about bromeliad culture can be frustrating because there are no pat answers to any of them. One of the most common questions is "What extremes of temperature can my bromeliad stand?" or, more specifically in this part of the country, "How cold is too cold?" Well, this could almost be classed as a 'Ripley's Believe It Or Not' answer because the following is what happened to some of the plants in my two window greenhouses (measuring 5 feet high, 3 feet wide, and 2 feet deep, facing south and unheated) during that record cold of January 16 and 17 when the temperature dropped to -20° both nights. At 11 a.m. on the 17th, I discovered that both greenhouses were covered with heavy frost and ice on all the inside glass surfaces, as well as being snow covered on the top outside surfaces. There was one-half inch of solid ice towards the outdoor side of both bottom pebble-filled trays and one-half inch of 33° water towards the room side of both trays. Air temperature was 45° towards the outside, and 60° on the room side. Frozen into the ice like so many ducks were Billbergia 'Santa Barbara,' Canistrum lindenii v. roseum, Cryptbergia rubra, three Neoregelia carolinae pups, Neoregelia eleutheropetala, N. 'Fairy Paint,' N. 'Owens'. Orthophytum saxicola. Puya chilensis seedling, and Vriesea 'Mariae.' Standing in the 33° water were Aechmea cylindrata, A. racinae, Cryptanthus bivittatus, Hohenbergia stellata, and Portea petropolitana. By 12:10 noon, the sun was on both greenhouses and thawing began. By 1:45 p.m. the air temperature in the greenhouses had risen to 85° in the sun, and most ice and frost on the inside glass, except that not in the direct sun, had melted. Ice in the bottom trays had melted enough to remove plants frozen into it. By 4:30 p.m. the insides of the glass began to freeze again, and I noticed that some ice in the bottom trays had not thawed all day. By 6 p.m. the greenhouse temperature had dropped to 30°; but all plants had been removed. Since that infamous day I have lost only two of the plants, but neither loss as, I feel, due directly to being frozen. The Puya chilensis was lost through improper handling; in being removed from the greenhouse in its frozen state it was snapped off right at the soil line. A Neoregelia carolinae pup was lost to rot after being allowed to swim in the water of a pebble-filled tray during a day in February when the greenhouse temperature rose to 100° and I forgot to open the vents. In a word, it got cooked. Every single one of the other plants is doing fine. The cryptanthus has already bloomed; the cryptbergia is now blooming, and the Aechmea racinae and the orthophytum are pupping and just coming into bloom. The billbergia has 3 new pups, and the portea and canistrum seem to have doubled in size. There is no tell-tale "ring around the collar" characteristic of water having frozen in the cups. The only remaining evidence on some is missing leaf tips where plants were frozen against the glass and plant tissue was destroyed. Lest you are now considering "freeze therapy" for your plants, let me say that my experience is only an isolated one and what has happened since then might have happened in spite of the freeze, not necessarily as a result of it. Also keep in mind that the plants mentioned were and are acclimated to wintering in unheated window greenhouses. However, I feel that one might venture this conclusion: Under closely monitored situations, some bromeliads can be exposed to extreme cold and even survive freezing conditions for very short periods of time. After the World Bromeliad Conference in New Orleans, we may have viewed our bromeliads with a somewhat jaundiced eye. But it was not really a jaundiced eye that caused all that yellowing and loss of color. In Texas, we are used to warm summers with abundant sunshine but this past summer was a little different. For a long time we have been aware that it takes strong light to develop color in many bromeliads but that excessive light can cause fading and bleaching and even burning. In previous summers I have had no problem with leaf burn from the sunshine and only moderate fading when plants were left in nearly full day sun for the entire season. I had always conditioned my plants slowly to the strong light and summer heat but this year the excessively high temperatures came very early (the first days of June) and the bromeliads were not yet ready for them. These high temperatures occurred while I was in New Orleans enjoying the Conference, and the bromeliads I left outdoors at home failed to have their usual watering with the hose which they normally get daily during periods when the temperature is near 100°F. So when I returned home, there was burn damage on a few plants and widespread fading. In a panic, I moved many plants into more shaded areas. As the temperature continued to flirt with the 100°F mark for weeks (topping out at 109°F), I noticed that even bromeliads in light shade began to lose color. And nearly all of the bromeliads seemed to stop growing. Offshoots appeared but failed to grow. It seemed as though all growth almost ceased and that the plants tried merely to exist during the long heat wave. With daily sprinklings, there was no further burning however. But the reactions of the plants has caused me to wonder if heat alone (without direct sunshine) can cause fading and loss of color. I believe it can. Can the excessive heat also slow down the general growth of bromeliads? Again, I believe it can. In this connection, there was a wire service article in the Dallas Morning News (July 24, 1977) which reported how temperatures over 90°F slowed down the growth of the rampant, and nearly indestructible, kudzu vine in Georgia and other southern states. Does burning of foliage increase as the humidity decreases? This seems very possible as I suffered no burning previously when I provided the bromeliads with daily sprinklings even those left in nearly full day sun and on days when the temperature rose several degrees over 100°F. These few observations are not based on scientific tests but I do believe that it is very likely that excessive heat alone can cause fading and affect the growth of bromeliads. Also it seems probable that burning occurs more easily when plants are not provided with sufficient humidity. Perhaps, the ravages of the past summer have taught us a few facts and we may be prepared for those hot summers which surely lie ahead in the future. Julian Nally was a rare individual. His dynamic personality and superb talent for writing extraordinary letters gained him admiration from countless people. He grew his bromeliads by the acre and without a doubt was truly a pioneer bromeliad grower in our country. In his early years this enthusiastic Princeton University graduate pursued a colorful career in journalism, which included work as a writer for NBC radio, that is, since television was yet to be invented. Yes, Julian Nally was a pioneer in many respects. In the late 1930's he came to Florida. 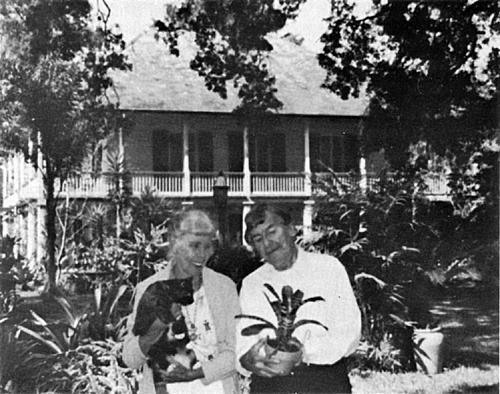 Good fortune enabled him to obtain the famous estate of the late Dr. Henry Nehrling, another early Florida bromeliad enthusiast. 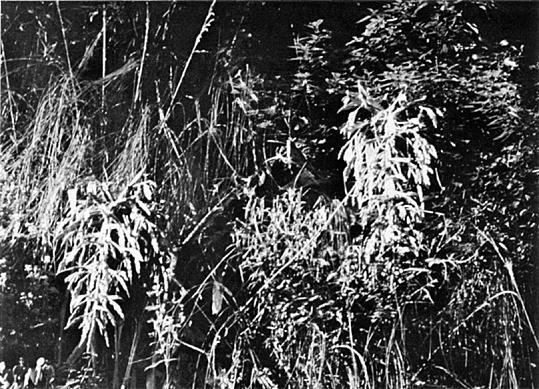 Dr. Nehrling cultivated many unusual varieties of plants in his majestic woodland setting and left behind a fantastic collection of bamboo planted throughout the acreage. So in the quaint settlement of Gotha, Julian Nally began to add more history to an already historical site. The planting began in 1938 with a pickup truck load of bromeliads purchased from a local nurseryman. They were mostly Neoregelia spectabilis and marmorata hybrids. Soon the Neoregelias were thriving outdoors in neat rows under picturesque live oak trees. Mother Nature took care of watering and feeding the plants, and the central Florida winters caused little or no damage. Julian Nally loved to experiment and was constantly bringing new plant varieties to grow in his extensive outdoor gardens. He began growing gloriosa lilies, mostly Gloriosa rothschildiana, and soon discovered there was a tremendous commercial demand for them as cut flowers. Eventually he planted several acres with tubers and shipped thousands of flowers nationwide. Unfortunately disaster struck as an uncontrollable virus which ultimately required that all his tubers be destroyed. He may well have been the first to commercially introduce the gloriosa lily. All the while, his bromeliads continued to flourish and multiply. Julian Nally was a master propagator. He meticulously removed offsets from his beloved Neoregelias and kept expanding the original planting. The sight was so incredible that he decided to propagate by seed, as well, to obtain even more bromeliads at a faster rate. Thousands of seedling Neoregelias eventually took root amongst the trees until there were over 7 breathtaking acres of colorful Neoregelias! Neoregelias were not the only bromeliads that Julian Nally grew by the acre. He was captivated by the European hybrid, Vriesea 'Mariae' and after many years expanded a mere handful of plants into a field of thousands. When in full bloom, the field was alive with countless, brilliant red and yellow "painted feathers" — simply unbelievable. Julian Nally also devoted about 3 acres to a hybrid of Aechmea miniata var. discolor widely known today as Aechmea `Maginali' g., named in honor of his wife Maggie. Scattered throughout the woods were smaller patches of bromeliads representing perhaps several hundred varieties. He did maintain a greenhouse for his rare specimens, and that collection at one time ranked among the best. Julian Nally could not be remembered without mentioning his close friend, the late Ed Ensign of Orlando, for together they grew thousands of bromeliads from seed and produced some extraordinary plants: Aechmea orlandiana var. Ensign and Aechmea lueddemanniana marginata 'Mend' came out of their seed flats. Julian Nally also enjoyed hybridizing and made a number of fine crosses; however, most of them have not yet been registered. His Aechmea 'Valencia' g. (Ae. ramosa × Ae. penduliflora) with its radiant red foliage and colorful inflorescence is an outstanding example of his achievements. 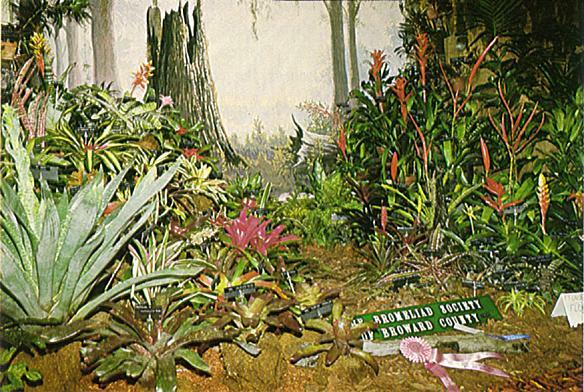 When The Bromeliad Society, Inc. was formed, he became a charter member and served on the Board of Directors from 1951 through 1970. A number of his interesting articles were published in early issues of the Journal of The Bromeliad Society. 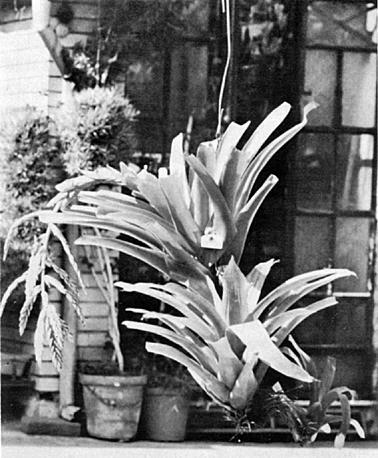 In 1963 Dr. Lyman B. Smith named a new species in honor of Julian Nally, Aechmea nallyi. It was collected in Peru by Lee Moore and was first flowered by Julian Nally in 1962. Many have confused this rare species with an Aechmea comata hybrid some have called Aechmea × nallyi. The plants are actually quite distinct. In 1971 an extraordinary plant was found in the vast field of Neoregelias. 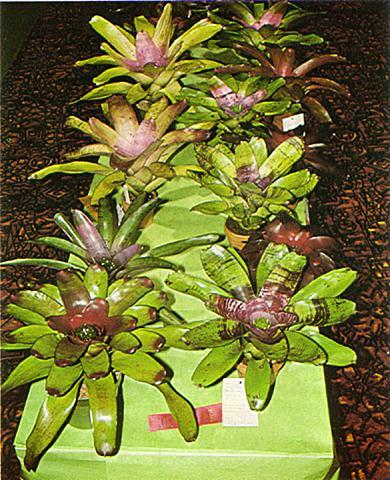 It was a variegated sport of a Neoregelia marmorata hybrid. This captivating plant with its broad white margins soon became his favorite. For nearly 40 years, Julian Nally grew bromeliads and amassed a collection of probably half a million plants. In all he was literate and articulate, hospitable and generous with his time and knowledge of plants. His unique achievements and genuine love for growing plants will fondly be remembered by a great many bromeliad enthusiasts throughout the world. We shall not soon again see his like. The bromeliad that created the greatest interest at the New Orleans show in June was Guzmania 'Orangeade' emanating from the nursery of De Meyer - De Rouck in Belgium and patented by them. This beautiful plant originated in a batch of seedlings that were sown in August 1973 and selected when the plants flowered in August 1976. The plant is a large one. According to Mr. De Meyer, it develops a peduncle of 45 to 75 cm. The leaves 10 to 25 in a graceful rosette, are lanceolate and measure to 60 cm in length and variously from 3.5 to 5.5 cm in width. The whole plant reaches a diameter of 80 to 90 cm. The upper side of the leaves is yellow green; the underside is green. The base is either striped or spotted with purple. The peduncle is stout and stiffly erect. The flower bracts in the middle of the inflorescence are completely orange-red and shiny. The inflorescence has a diameter of 20 to 30 cm and is made up of several cluster of 6 to 10 light yellow flowers. The inflorescence lasts for more than three months.